Pseudomonas pneumonia is an inflammation of the lung tissues caused by a rod-shaped bacterium called aeruginosa. Aeruginosa bacterium is considered a very dangerous, antibiotic resistant type that is very difficult to treat because it affects already critically ill patients. Patients with severely compromised immune system, having previously undergone antibiotic or steroid therapy, underweight and malnourished, with a vast history of chronic medical conditions are in the risk group for developing pseudomonas pneumonia. In addition, pseudomonas aeruginosa bacterium thrives in various types of environment, especially at the hospital, it frequents ventilator tubing equipment, sinks, hospital food and even disinfectant solutions. Pseudomonas pneumonia has very little chances of affecting an average healthy individual with a strong immune response and mostly targets already ill people with a myriad of health problems like HIV, cystic fibrosis and chronic lung disease. Once a patient is exposed to pseudomonas bacteria, it can quickly progress into multilobar pneumonia, meaning that it can affect more than one lobe of the lungs making finding the right treatment extremely challenging and sometimes requiring the use of more than one type of antibiotics. If a patient is not properly diagnosed for pseudomonas pneumonia and prescribed the wrong type of antibiotics the bacteria could be resistant to, the patient has more chances of developing cryptogenic organizing pneumonia characterized by granulation in the lung and bronchial tissues. 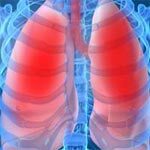 If you are wondering is walking pneumonia contagious along with pseudomonas pneumonia and other types of lung infections, the answer is yes, especially if your immune system is already weakened by age, pregnancy or a health condition. Make sure you limit contact with individuals diagnosed with any kind of pneumonia until they start antibiotic therapy and show signs of illness improvement.